CRISPR Plasmids. Transfect cells with our CRISPR plasmids with Cas9 and sgRNA for human, mouse, and rat. Search our database of more than 45,000 human, mouse, and rat genes for genome editing using CRISPR. CRISPR Lentivirus. Genome integration of CRISPR elements using lentivirus. Cas9 and/or sgRNA packed in purified lentiviral particles at 108 TU/ml, ready to infect all cell types. CRISPR AAV. Episomal expression of CRISPR components with adeno-associated viral particles carrying Cas9 and/or sgRNA, excellent for tissue and animal transduction. Cas9 Stable Cell Lines. Premade Cas9-expressing stable cell lines are great for sgRNA library screening and other high-throughput CRISPR-Cas9 applications. sgRNA expression plasmids are available for targeting virtually any gene in any experimental system. sgRNA plasmids express either sgRNA only, or sgRNA + Cas9 nuclease in an all-in-one format. Lentiviral clones express sgRNA alone. Cas9-expressing lentiviral clones are available separately. The CRISPR plasmid options listed below are intended for using 20 nt sgRNAs with the wild-type Cas9 nuclease from Streptococcus pyogenes (SpCas9). GeneCopoeia also provides alternate CRISPR options, such as Cas9 D10A nickase and other high-fidelity versions of Cas9, SaCas9, and shorter sgRNAs. To purchase reagents for these other options, please contact us for a custom quote. Clones expressing human codon-optimized S. pyogenes Cas9 nuclease or D10A nickase are available. These clones do not express sgRNAs. * Discount applied when purchased together with a sgRNA clone. Click here to search our database of sgRNA plasmids for knocking out more than 45,000 human, mouse, and rat genes. sgRNA for human, mouse, and rat packaged in high-titer lentivirus. Visit the Cas9 stable cell line page for a full list of the Cas9 cell line collection. GeneCopoeia also offers stable cell lines constitutively expressing the CRISPR Cas9 nuclease, enabling you to carry out CRISPR genome editing applications with high efficiency. The GeneHero™ Cas9 stable cell lines are available pre-made in many human cell lines, and in mouse cell line Neuro2a. The CRISPR Cas9 nuclease is stably integrated into either the human AAVS1 or mouse ROSA26 “Safe Harbor” sites (Figure 1), or randomly via lentiviral-mediated transduction. Note: GeneCopoeia also offers custom-built Cas9-expressing stable cell line services. To inquire, please contact inquiry@genecopoeia.com. The clustered, regularly interspaced, short palindromic repeats (CRISPR) system is bacterial immunity mechanism for defense against invading viruses and transposons. This system has been adapted for highly efficient genome editing in many organisms. Compared with earlier genome editing technologies such as zinc finger nucleases (ZFNs) and transcription activator-like effector nucleases (TALENs), CRISPR-Cas–mediated gene targeting has similar or greater efficiency. Genome editing has been used for numerous applications, as shown in Table 1. Table 1. Applications for CRISPR-mediated genome editing. Gene knockout Permanently modify DNA to eliminate gene function. In the type II CRISPR systems, the complex of a CRISPR RNA (crRNA) annealed to a trans-activating crRNA (tracrRNA) guides the Cas9 endonuclease to a specific genomic sequence, thereby generating double-strand breaks (DSBs) in target DNA. This system has been simplified by fusing crRNA and tracrRNA sequences to produce a synthetic, chimeric single-guided RNA (sgRNA). The sgRNA contains within it a 20 nucleotide DNA recognition sequence (Figure 1). Figure 1. 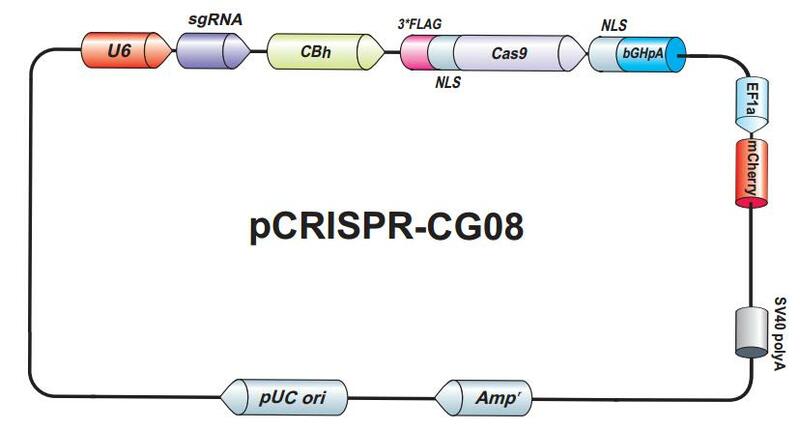 Mechanism of CRISPR-Cas9-sgRNA target recognition and cleavage. When the Cas9-sgRNA complex encounters this target sequence in the genome followed by a 3 nucleotide NGG PAM (protospacer adjacent sequence) site, the complex binds to the DNA strand complementary to the target site. Next, the Cas9 nuclease creates a site-specific double-strand break (DSB) 3-4 nucleotides 5' to the PAM. DSBs are repaired by either non-homologous end joining (NHEJ), which is error-prone, and can lead to frameshift mutations, or by homologous recombination (HR) in the presence of a repair template (Figure 2). Figure 2. CRISPR-Cas9-based gene engineering. Left. DSBs created by sgRNA-guided Cas9-mediated cleavage are repaired by NHEJ. Right. DSBs created by sgRNA-guided Cas9 nuclease are repaired homologous recombination between sequences flanking the DSB site, thereby causing "knock in" of sequences on a donor DNA. While the CRISPR system provides a highly efficient means for carrying out genome editing applications, it is prone to causing off-target indel mutations. Off-targeting is caused by the ability of the Cas9- sgRNA complex to bind to chromosomal DNA targets with one or more mismatches, or non-Watson-Crick complementary. The propensity of CRISPR for off-target modification is a significant concern for some researchers who want to avoid results that are potentially confounded by off-target modification, as well as for those who might be interested in developing CRISPR for gene therapy applications. Several strategies have been employed to mitigate CRISPR's propensity for off-target genome modification. One such strategy is to use double nickases to create DSBs. The Cas9 D10A mutant is able to cleave only one DNA strand, thereby creating a "nick". When two sgRNAs that bind on opposite strands flanking the target are introduced, two Cas9 D10A nickase molecules together create a staggered-cut DSB, which is then repaired by either NHEJ or HR (Figure 3). The double nickase strategy has been shown to greatly reduce the frequency of off-target modification. However, double nickases are limited in utility by design constraints; the sgRNAs must be on opposite strands, in opposite orientation to one another, and display optimal activity when spaced from 3-20 nucleotides apart. In addition, the cleavage activity of double nickases tends to be lower than that of standard Cas9-sgRNA. Further, nickases can still cause some degree of off-target indel formation. Figure 3. General scheme of Cas9 double-nickase strategy. From Ran, et al. (2013). Two additional strategies, the use of truncated (17-18 nucleotide) sgRNAs, as well as a Cas9-FokI fusion, also dramatically reduce CRISPR-mediated off-target genome modification. However, these methods suffer from even further reductions in on-target activity and/or more severe design constraints compared with the double nickase approach. Recently, two groups demonstrated that engineering Cas9 variants carrying 3-4 amino acid changes virtually eliminates CRISPR off-target genome modification. These variants still retain high on-target activity, without the design constraints of previous approaches, providing a promising alternative for high-fidelity CRISPR-mediated genome editing. Jiang, W., Bikard, D., Cox, D., Zhang, F., and Marrafï¬ni, L.A. (2013). RNA-guided editing of bacterial genomes using CRISPR-Cas systems. Nat.Biotechnol. 31, 233–239. Hsu, P.D., Scott, D.A.,Weinstein, J.A., Ran, F.A., Konermann, S., Agarwala, V.,Li, Y., Fine, E.J., Wu, X., Shalem, O., et al. (2013). DNA targeting speciï¬city of RNA-guided Cas9 nucleases. Nat. Biotechnol. Published online July 21, 2013. CRISPR genome editing-the ability to make specific changes at targeted genomic sites-has transformed research in biology and medicine, due to its precision, ease of use, and relatively low cost. CRISPR's many applications include gene knock out, gene tagging, correction of genetic defects, and gene activation. In this webinar, we discuss how to use GeneCopoeia’s CRISPR technology for efficient genome editing in mammalian cell lines. CRISPR-Cas systems have been successfully re-purposed from bacterial adaptive immune mechanisms for the modification of genes. Most CRISPR-mediated gene modifications include permanently changing the genetic code for such applications as gene knockout, mutagenesis, and fusion tagging. However, CRISPR-Cas has also been adapted for stimulating gene transcription, without modifying coding sequences. In this webinar, we discuss how GeneCopoeia CRISPR products and services can help you get more from your transcriptional activation applications. 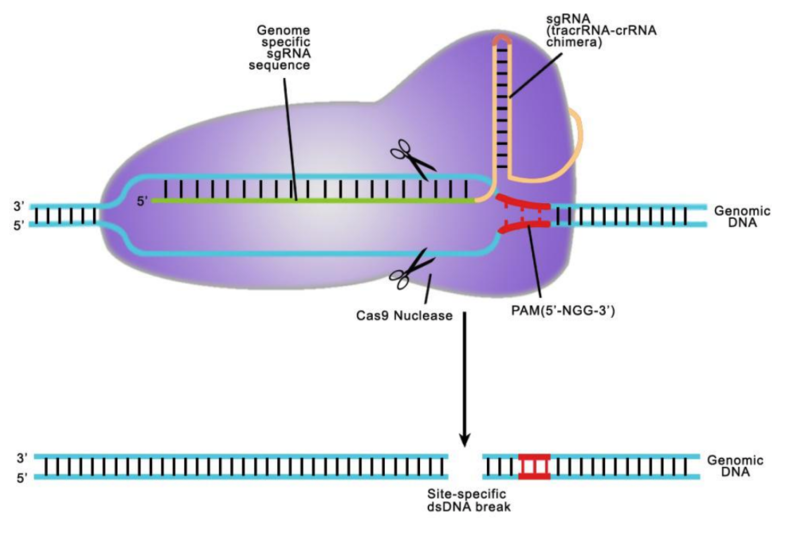 The CRISPR-Cas9 system has become greatly popular for genome editing in recent years, due to its ease-of-design, efficiency, specificity, and relatively low cost. In mammalian cell culture systems, most genome editing is achieved using transient transfection or lentiviral transduction, which works well for routine, low-throughput applications. However, for other applications, it would be beneficial to have a system in which one component, namely the CRISPR-Cas9 nuclease, was stably integrated into the genome. In this webinar, we introduce GeneCopoeia’s suite of Cas9 stable cell lines, and discuss the great utility that these cell lines provide for genome editing applications. Insertion of transgenes in mammalian chromosomes is an important approach for biomedical research and targeted gene therapy. Traditional lentiviral-mediated transgenesis is effective and straightforward, but its random integration can often be unstable and harm cells. "Safe Harbor" sites in human and mouse chromosomes have been employed recently as an alternative to random, viral-mediated integration because they support consistent, stable expression, and are not known to hamper cell fitness or growth. In this webinar, we will discuss the merits of Safe harbor transgenesis approaches, and how GeneCopoeia's CRISPR tools for Safe Harbor knock-in can greatly benefit your research. Biomedical researchers are enjoying a Renaissance in functional genomics, which aims to use a wealth of DNA sequence information—most notably, the complete sequence of the human genome—to determine the natural roles of the genes encoded by the genome. As a result, biochemical networks and pathways will be better understood, with the hope of leading to improved disease treatments. Researchers are turning increasingly to CRISPR (clustered, regularly interspaced, short palindromic repeats) for functional genomics studies. Several groups recently adapted CRISPR for high-throughput knockout applications, by developing large-scale CRISPR sgRNA libraries. GeneCopoeia recently launched a number of smaller, pathway- and gene group-focused CRISPR sgRNA libraries, which offer several key advantages over the whole-genome libraries. In this 40 minute webinar, we discuss the merits and applications for CRISPR sgRNA libraries, how to use CRISPR sgRNA libraries, the advantages of using small, pathway- and gene group-focused libraries, and how GeneCopoeia can help you with your high-throughput CRISPR knockout studies. Ji, Q., et al. (2017). Genetically engineered cell lines for α1-antitrypsin expression. Biotechnology Letters doi: 10.1007/s10529-017-2391-5 [Genome-CRISP™ human AAVS1 Safe Harbor Knock-in kit and AAT knock-in ORF donor clone]. How do I order CRISPR reagents from GeneCopoeia? Answer: If you are doing simple gene knockouts in humans or mice, you can order CRISPR sgRNAs on our website. All you need to do is go to the , search for your gene, and then choose the appropriate clones that will work for your system. These CRISPR sgRNAs are designed by default to knock out all possible known and predicted transcript variants of your gene, and are targeted early in the coding regions. You can also order donor clones for these knockouts from the search results page. If you are doing a different application, such as introducing a point mutation, then you will need to and, after determining what you need, we will send you a custom quote. What delivery formats do you offer for your CRISPR plasmids? Answer: For sgRNA clones (including both all-in-one Cas9/sgRNA clones and sgRNA-only clones, the default delivery format is bacterial stock. You have the option of ordering purified DNA for these clones for an additional charge. For HDR donor clones, the default delivery format is purified DNA. What is the turnaround time of your CRISPR clones? Answer: The turnaround time for sgRNA clones (including both all-in-one Cas9/sgRNA clones and sgRNA-only clones) is 2-3 weeks. The turnaround time for HDR donor clones depends greatly on the nature of the modification that the clone is being used for. For HDR donor clones used for simple knockout, the turnaround time is 2-4 weeks. Other HDR donor clones, such as those used for fusion tagging or mutagenesis, can take 6-8 weeks, but can also take longer. Can you tell me the sequence of the sgRNA target sites? Answer: Yes. We sequence the inserts of each CRISPR sgRNA clone, and provide you with datasheets that show the full sequence of each clone (including HDR donor clones), a map, restriction enzyme digestions sites, and suggested sequencing primers. To obtain these datasheets, you just need to visit our on our website. You will need an account on our website, your catalog number(s), and your sales order number. Why do I still get drug resistant colonies when I transfect a donor without CRISPR? Answer: In the presence of drug, the only way for cells to survive is to integrate the plasmid into the chromosome, so it is possible to get drug-resistant clones that were only transfected with the donor plasmid. However, such integration is random. CRISPR increases donor targeting frequency by several orders of magnitude. Can I introduce a point mutation using CRISPR technology? Answer: Yes. For this you will need a donor that is homologous to your locus on either side of the base you want to mutate. The donor can be either a plasmid or a single-strand oligonucleotide. The donor is co-transfected with the CRISPR plasmids. Formation of a double strand break (DSB) leads to repair of the break by homology-directed repair (HDR) using the donor as a template. GeneCopoeia recommends our donor plasmid design and construction service. We will construct a donor plasmid that contains a defined modification, flanked by a selectable marker such as puromycin resistance, and homologous arms from your target region. The donor may or may not also include a fluorescent reporter such as GFP. The markers can be flanked by loxP sites, to permit Cre-mediated removal, if desired. Use of a GeneCopoeia-designed donor plasmid allows you to select for edited clones and reduces the number of clones required for screening. You can also purchase our donor cloning vectors for do-it-yourself donor clone construction. Why should I use HDR for genome editing? Answer: There are two strong reasons to use HDR for genome editing: 1) It is precise and controllable. Any desired change can be implemented; 2) You will be able to use a knocked-in marker (such as drug resistance or fluorescence), which will greatly facilitate your ability to identify candidate clones that have the modification you want. GeneCopoeia recommends our donor plasmid design and construction service. We will construct a donor plasmid that contains a defined modification, flanked by a selectable marker such as puromycin resistance, and homologous arms from your target region. The donor may or may not also include a fluorescent reporter such as GFP. The markers can be flanked by loxP sites, to permit Cre-mediated removal, if desired. Use of a GeneCopoeia-designed donor plasmid allows you to select for edited clones and reduces the number of clones required for screening. You can also purchase our donor cloning vectors for do-it-yourself donor clone construction. For which species do you offer these services? Answer: Our genome editing products can be used for virtually all species. Our standard plasmids for CRISPR are designed for work in mammalian cells. In addition, these plasmids can be used as templates for T7 promoter-driven in vitro transcription, for introduction into mice, zebrafish, Drosophila, and many other model organisms. Further, we can generate custom constructs that can be used in a wide variety of organisms. Do you have to co-transfect CRISPR with the donor at the same time? Answer: Yes. The donor must be present when the DSB is formed in order to be used as a repair template. Otherwise, the cell must use non-homologous end joining (NHEJ) in order to repair the DSB, because unrepaired DSBs are lethal. Do the plasmids get integrated? Answer: Our CRISPR plasmids typically do not integrate into the host genome in transfection experiments. However, after clonal selection for edited cells, we recommend screening clones for those which have lost the nuclease plasmids. This can be done by testing clones to see if they have become sensitive to the antibiotic of the resistance gene on the plasmid, or if they no longer express the plasmid's fluorescent marker (where applicable). Our lentiviral clones are expected to integrate randomly into chromosomes. How do I deliver CRISPR system plasmids into cells? Answer: The presence of the CMV or other promoters driving expression of the Cas9 coding sequences permits expression from the plasmid DNA. sgRNA transcription is driven by the U6 promoter. We recommend that you use the most efficient method for your cell type of interest. The following are all acceptable approaches for delivering our genome editing tools into cells: 1. Standard transfection. GeneCopoeia recommends our EndoFectin™ transfection reagents. 2. Electroporation. 3. Lentiviral transduction (cannot be used with HDR donors). 4. Micro-injection of either DNA or mRNA. The plasmids can be used as templates for in vitro transcription. How can I detect a mutation if there is no selection? 1. If you are making an insertion or deletion, the easiest way to screen your cells is by PCR using primers flanking the modified site, provided that the insertion or deletion is large enough to detect by standard agarose gel electrophoresis. 2. For very small insertions or deletions, you can screen your clones using GeneCopoeia's IndelCheck™ T7 endonuclease I assay, which is a method that detects mutations by cleaving double stranded DNA containing a mismatch. You can also screen using Sanger sequencing of PCR products. 3. If you are introducing a point mutation, then you can use either real-time PCR or Sanger sequencing to detect the modification. 4. If the modification you are introducing creates or destroys a restriction enzyme site, then enzyme cleavage of PCR products can be used to distinguish between modified and unmodified alleles. 5. Finally, either Sanger sequencing of PCR products or Next Generation sequencing of whole genomes can be used to screen for modifications. Regardless of which screening method you choose, it is also important that you are able to determine whether only a portion or all of the alleles have been modified. In order to reduce the amount of time and effort required to identify edited clones, GeneCopoeia recommends our donor plasmid design and construction service. We will construct a donor plasmid that contains a defined modification, flanked by a selectable marker such as puromycin resistance, and homologous arms from your target region. The donor may or may not also include a fluorescent reporter such as GFP. The markers can be flanked by loxP sites, to permit Cre-mediated removal, if desired. Use of a GeneCopoeia-designed donor plasmid allows you to select for edited clones and reduces the number of clones required for screening. You can also purchase our donor cloning vectors for do-it-yourself donor clone construction. How do I verify success of editing experiments using HDR? Answer: For safe harbor integration, we recommend PCR using primers designed to amplify the recombination loci, or Southern blotting, which can rule out random integration. All GeneCopoeia Safe Harbor Gene knock-in Kits contains PCR primer pairs intended for this exact purpose. For other editing experiments using HDR, junction PCR can be be used to identify edited sites. The PCR method will will only yield product if donor integration occurred at the correct genomic site. Southern blotting or PCR using primers recognizing the plasmid backbone can also be used to rule out random integration. Can I use CRISPR to knock out microRNAs? Answer: Yes. Even though frameshifts are not possible with miRNAs and other noncoding RNAs, an indel occurring in a critical region, such as the mature sequence of a miRNA, should be enough to abolish its function. Will CRISPR keep cutting the chromosome after the gene is edited? Answer: The vector backbones of our CRISPR sgRNAs are designed to not replicate in the host. These plasmids, which are transiently transfected, will typically be lost after several rounds of cell division and will not further affect the host cell. After transfection, cells are plated at low density to promote the formation of single colonies. These colonies should be screened to ensure that they have lost the plasmid(s). This can be done by testing clones to see if they have become sensitive to the antibiotic of the resistance gene on the plasmid, or if they no longer express the plasmid's fluorescent marker (where applicable). However, even if the TALEN or CRISPR plasmid integrates, it can no longer cut the site after it is edited, because NHEJ destroys the TALEN or sgRNA recognition site. To be completely assured that the transfection is transient, we recommend delivering RNA instead of plasmid DNA. If you are using HDR, we recommend engineering synonymous mutations into the donor to destroy the TALEN or sgRNA recognition site. Can you get double-allele modification? Answer: Yes. CRISPR has been shown to be able to disrupt multiple copies at once. The efficiency varies depending on different factors, such as cell type, transfection efficiency and TALEN/CRISPR activity. Can I use the nickase instead of wild-type Cas9? Answer: Yes. We have the reagents for the Cas9 D10A nickase, and have successfully tested our double nickase designs. However, in order to create mutagenic DSBs, the nickase requires the correct targeting of two appropriately-spaced sgRNAs on opposite strands, flanking the break site. Because proper sgRNA targeting requires the presence of the N-G-G “PAM” site immediately following the recognition site, it might not always be possible to use the nickase for DSB formation. There are also “high-fidelity” variants of Cas9 nuclease that edit genes with greater specificity than wild type Cas9, but sometimes with reduced efficacy and with increased design constraints. However, since these high fidelity variants use only one sgRNA, they are easier to work with than Cas9 niclases. Can you use the double nickase approach with HDR? Answer: Yes. To create a DSB, the nickase requires the correct targeting of two appropriately-spaced sgRNAs on opposite strands, flanking the break site. This is sufficient to stimulate HDR between the target site and the donor. While this method has the advantage of potentially fewer off-target NHEJ-mediated mutations, since single strand nicks are repaired with higher fidelity than DSBs, it is not without limitations. Proper sgRNA targeting requires the presence of the N-G-G “PAM” site immediately following the recognition site. Therefore, it might not always be possible to use the nickase for HDR. Can I purchase your empty guide RNA backbone plasmids? Answer: We only sell plasmids containing our custom-designed CRISPR sgRNAs. If you need a negative control, we also sell a CRISPR plasmid containing a scrambled sgRNA. Can I purchase your empty donor backbone plasmids to make my own donors? Can I use CRISPR for gene activation or repression? Answer: Yes. There is a double mutant of the Cas9 nuclease that completely abolishes nuclease activity. This mutant can be fused to a transcriptional modulator such as VP64 and targeted to specific genes. You can also use the catalytically dead Cas9 with properly-designed sgRNAs to repress, or interfere with, gene expression. Do you have CRISPR in lentivitral vectors? Answer: Yes. We have both non-viral and lentiviral formats. We also have , in which we can provide you with lentiviral particles expressing both Cas9 and sgRNAs. Can I use the CRISPR lentiviral delivery for HDR? Answer: Unfortunately, no. Lentiviruses enter cells as RNA, but HDR donors must enter the cells as DNA at the same time as Cas9 and the sgRNAs. Why do I need to use a Cas9 stable cell line? Answer: Cas9 stable cell lines are primarily useful for CRISPR sgRNA library screening. sgRNA library screening is typically done with lentivral delivery. In principle, it is possible to either co-infect your cell line with one Cas9-expressing lentivirus and with an sgRNA-expressing lentivirus, or with a single “all-in-one” lentivirus (Cas9 and sgRNA expressed in the same virus). However, in practice, due to the large size of the Cas9 gene (4.4 kb), the titers of Cas9-expressing lentiviruses tend to be much lower than sgRNA-expressing lentiviruses. Therefore, we recommend using a cell line that has previously had Cas9 stably integrated in the genome for infection with lentiviral-based sgRNA libraries. GeneCopoeia carries a large collection of pre-made Cas9-expressing stable cell lines. You can also purchase reagents that you can use to build a Cas9 stable cell line yourself, or you can have GeneCopoeia create a custom Cas9-expressing stable cell line as a custom project. What delivery formats do you provide the sgRNA libraries in? Answer: Lentiviral particles, transfection-ready DNA, and bacterial stock. Are the sgRNA libraries available as individual clones? Answer: Yes. Currently, our sgRNA libraries are available standard as pools. However, if you wish to receive your libraries as individually arrayed clones, simply for a custom quote. Can I co-transduce the sgRNA and Cas9 lentiviral particles? Answer: Yes. However, we strongly recommend that you use a cell line that is stably expressing Cas9 to transduce sgRNA-expressing lentiviral particles with, in order to best maintain consistent representation of each sgRNA in the library. To save you time and effort, GeneCopoeia provides a large collection of Cas9-expressing stable cell lines that are ideally suited for sgRNA library screening. If you would like to create a Cas9-expressing stable cell line yourself, you should first transduce your cells with Cas9-expressing lentiviral particles. Once you have established the stable Cas9-expressing cell line, use the sgRNA libraries for transduction. Can the sgRNA library lentiviral plasmids be transfected instead of using lentivirus? Answer: Yes. The lentiviral plasmids are "dual-use", so that they can either be packaged into lentiviral particles or transfected into cells by standard transfection methods. Is the representation of sgRNAs in each library validated by Next Generation Sequencing or another method? Answer: Our sgRNA representation does not need to be validated by Next Generation Sequencing. Each library is small compared with the genome-wide libraries, and each sgRNA clone is constructed individually, cultured in E. coli individually, then pooled as E. coli in approximately equal amounts. From those pools we prepare DNA and then, if necessary, lentiviral particles.